Productivity – Ben Boyle lives here! We’ve been talking a bit at work recently about avoiding interruptions. I have been surprised how many people let email interrupt them. When the phone rings, sure, you are kind of expected to drop everything and answer it. It’s a courtesy. Hopefully the person calling is doing so because they need to talk about something urgently. After all, you ring someone—you are breaking their flow. You had better have a good reason. One of the great benefits of email is it is asynchronous. I don’t need to read your email immediately. I don’t need to reply right away. I can take time to think about it. Anyone can do this. It’s not rude, it’s good practice. The downside is we get so much of it, it piles up quickly. It’s tempting to read and respond to emails as fast as you can, to try to prevent this. But really—is your job to answer email or do you have something more important to do? 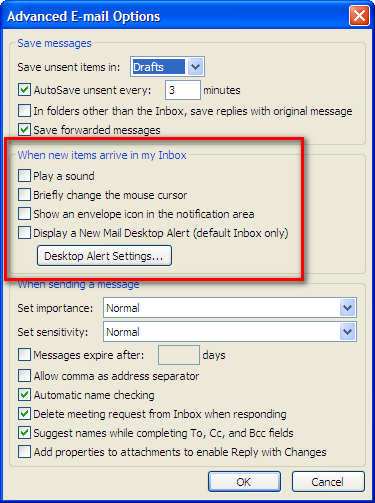 Turn off all the popups, sounds, icons and other reminders that you have received a new email. You are going to get emails. You know this. You don’t need immediate notification about each one—if it’s urgent, they will phone, right? 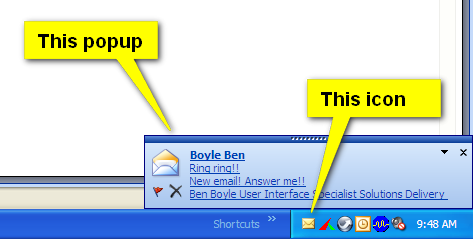 Turn that nonsense off so it stops interrupting while you are busy doing other work. 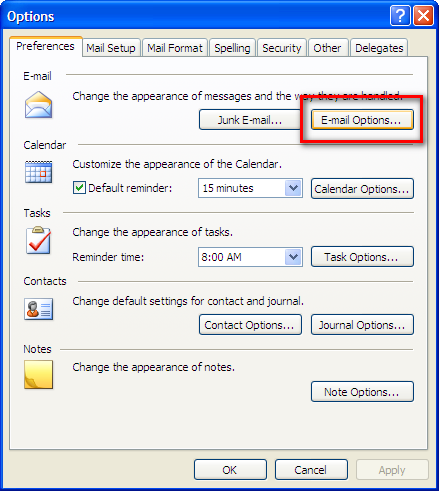 Your email program is not a telephone. Don’t treat it like one. 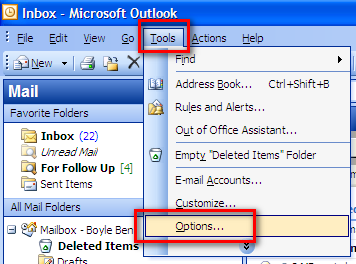 In Outlook, go to Tools, Options, Email options, Advanced email options. Untick all the boxes in the section labelled ‘When new items arrive in my inbox’. Use your filters, labels, colours to highlight the messages that are important to read. Your email program probably already highlights new messages that you haven’t read yet, so that’s a start. Do you get lots of group email? Messages sent to many recipients. 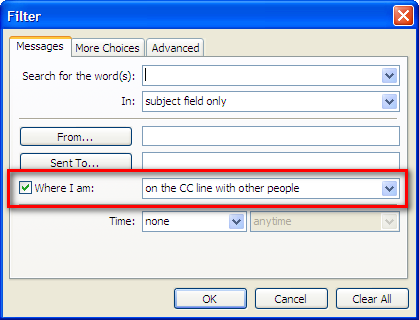 Are you only included on the CC line ‘for your information’? I like making those messages grey in my inbox. Light grey. You still see them, but you know they’re not important before you open them. And that helps you deal with them faster. 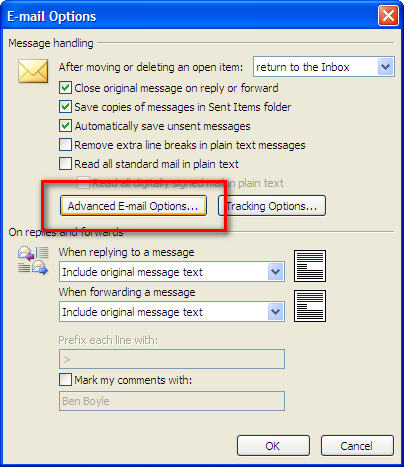 It’s easy to set this up in Outlook. 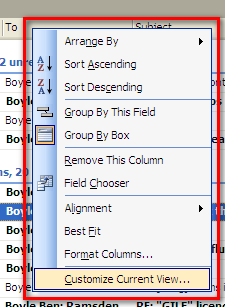 Right click on the column headings in your inbox and choose ‘Customize current view…’ then ‘Automatic formatting…’. Pick the font—including colours—you want, and then set the ‘Condition…’. You can add as many of these rules as you like. You could setup filters to move email into different folders, but I find keeping it in one view—my inbox—much simpler. I make an exception for high traffic mailing lists! By ‘high traffic’ I mean 20 or more emails per day. If you have better things to do than read email, you certainly have better things to be doing than sorting email. Use your inbox. Now you don’t know when new emails arrive, and you’re keeping all your email in your inbox, won’t it pile up? Only if you let it. Make time to check your email. You can do this as frequently as you like. If you’re busy working on something else, you will forget about email. This is what you want. No more interruptions! But when you have time—and you will—flick over to your email and check it. When I say check it, I really mean deal with it. Delete emails as fast as you can. 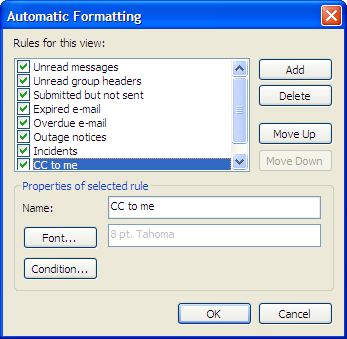 Anything you reply or forward you can delete, because you have a copy in your sent items. Archive them as fast as you can. Don’t organise them, just archive them. When you need them, you will have to search. But the amount of time you spend searching is nothing compared to how much time you will waste organising emails—most of which you probably won’t need. Forward on emails you can delegate. If you need to do work, acknowledge the email (a quick reply) and get it into your tasks list, calendar, wherever it belongs so you can catch up with it later. Watch inbox zero for more tips and answers to some common questions.